It's Saturday, ideal time for some travelling. My friends sugessted that Brugge would be nice place to see, to we agreed on trip to Belgium by train. Brugge showed up to be nice city that attracts a lot of tourists. And and two of mine czech speaking Erasmus friends agreed to meet at the train station at 8 a.m. We couldn't buy the tickets before, because there train people on strike in Belgium. But in the morning looked everything fine. There is really good offer for young people – younger that 26 years – one day return ticket to Belgium costs only 15€, but because it was bought at the cash desk it cost 50 cents more! I do not know why, but next time I will buy at at the automatic machine. I also met a friend from Canada – I have the Antitrust course with her, and guess what, she also wanted to go to Brugge! I offered her, that she can join us, as I would be more fun. 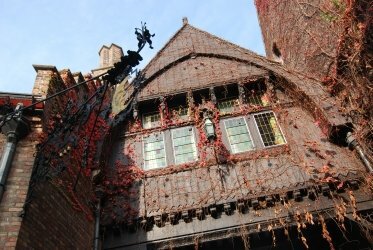 Now we were group of 4 people going to discover Brugge, we had no exact plan, no map but a nice sunny day and open mind. There is no direct train from Maastricht, we first had to go to Liege and there change the train. It was the first surprise and nice begin of today's trip for me. I really like travelling by train as it's comfortable, secure and fast mean of transfort for long distances. As we get off the train in Liege I was astonished by the train station. It was really large even Liege is not that big city (200 000 inhabitans), but mainly really interesting from the architecture point of view. There was a lot of light and space and the construction was just enormous. I made some pictures and then we waited for train to Brugge. According to the train schedule, the journey should take 3 hours, but we had some technical problems so we needed about 20 minutes more. We arrived to Brugge at 11:25. A lot of people get off the train here and also a there were a lot of people heading to the city centre. We checked the map at the station and joined the crowd. It was quite funny as everybody was taking pictures of the same buildings and places We could not believe that so many tourist would be there. It was just impossible to take a picture without having thousand of people on it, as there were still new people coming from the station the crowd had really no end. We took some side lane to get a bit space and quiet. We managed that only for a few moments, as we wanted to see something from the city centre and there were people everywhere. I had a feeling, that it was worse than in Prague. I am not sure, what places of interest we missed, as we were just randomly discovering the city. I really like the historical appearance of the houses, channel in the middle of the city, so there were a lot of stone bridges, narrow paved streets and historical monuments on every step. On the other hand, the city was just overcrowded, cars also in the middle of the city and compared to Maastricht, almost no bikes. There were also no special zones on the roads made for bikes as in Netherlands. Belgium is different in this way. We couldn't miss biscuit shop. Everything smelt so wonderfully and looked so tasty , but also the prices were quite high. I wonder why we do not have such shops in the Czech Republic. At least I haven't seen any so far. I also decided to buy a postcard and send it to my grandma. I haven't done anything like this for ages, so as this is my first trip since I arrived to Maastricht, than it's really good opportunity for that. I was happy for every time we left the main street and walked through empty side alleys, as at that time I was really enjoying myself. Good company and nice city. We therefore discovered interesting park with a lot of different threes in there and of course there was a church nearby. There were many big churches in Brugge and I realized, that I do actually have pictures of me mainly in front of them. Strange of me, as I am of no religion. As we had time to spare, I wanted to see the wind mill that were a bit far away from the city centre. But I think that at the end, everybody was fond of that idea and we had nothing better to do anyway. We took the train back at 16:58, so when a twilight came. We all were pretty tired and as I sleep in any mean of transport if I have nothing to keep me concentrated, I slept almost all the time. Till Liége we were also seated separately as the train was full. We had again several minutes time in Liége, ideal for night pictures I wish every Saturday would be like this one. I know that I had plenty of school stuff waiting for me, but I just put that out of mine mind and enjoyed nice trip with great friends. I hope we will soon meet again for another city discover. Article last edited 12. 11. 2011, viewed: 1247-times.